The goal of 5G commercial deployments has long been established as 2020. Both 3GPP and ITU agreed but it is to be accelerated. 3GPP aims to complete the specification of 5G Non-standalone (NSA 5G New Radio) mode of operation by March 2018. Followed by the completion of 5G Standalone (SA 5G NR) in September 2018. What is SA 5G NR? That's the brand new 5G network builds from scratch and on top of the new 5G core network. What is NSA 5G NR? 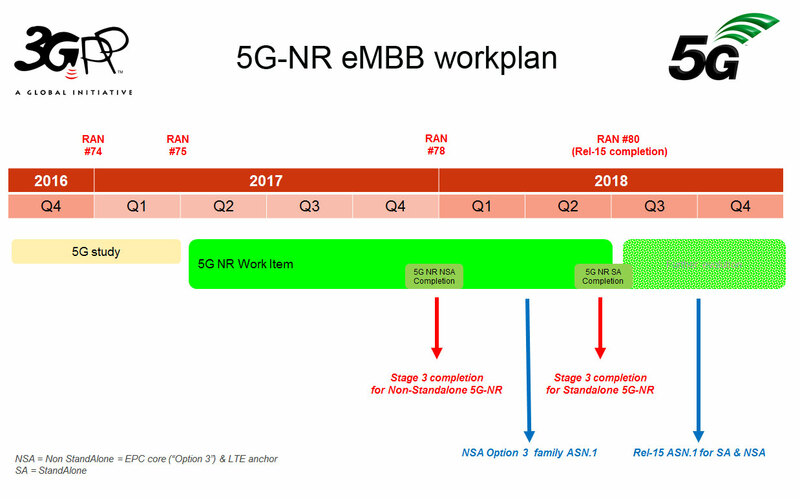 This Qualcomm blog post describes it as utilising "the existing LTE radio and core network as an anchor for mobility management and coverage while adding a new 5G carrier. This is the configuration that will be the target of early 2019 deployments (in 3GPP terminology, this is NSA 5G NR deployment scenario Option 3)." Among the proponents of the accelerated timeline include AT&T, SK Telecom, Qualcomm, Intel, Ericsson, Huawei, ZTE, Sprint, Deutsche Telekom, Apple, Broadcom, Cisco, Nokia, Verizon and Samsung. Back in the end of 2016 at the 4th China Mobile Global Partners Conference, China Mobile indicated that "the goal of completing nation-wide 5G deployment in China is without doubt." China Mobile further indicated to begin "commercial trials" of 5G in about 100 cities nation-wide in 2018. If its 4G deployment is of any reference, "commercial trials" means construction in full gear. China Mobile will begin 5G outdoor tests in 2017. Seems like for China Mobile and likely a few other large international operators, 5G isn't a dream in 2019.